Wow, I really can't believe I didn't read this sooner. This was a really great read!! I would have finished this book a lot sooner if I hadn't been so busy, but when I actually did have time to read, I flew through this book! I love the main characters, Violet and Jay. I really enjoyed watching their relationship change from just friends to more. It was sweet, and they are such a cute couple. (Jay is awesome!) I also liked Violet's friends. They were so witty and fun. And her family was great as well. They really cared for her, which is great. The bad guys were just Creepy!! Reading the parts where we're in the killer's mind more than freaked me out. Seriously.Parinoid! 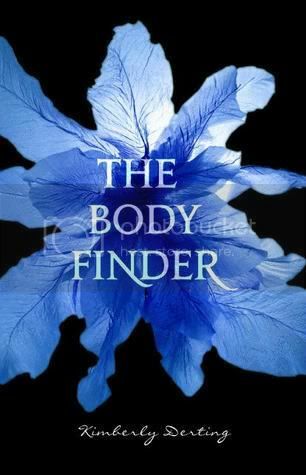 The Body Finder was a really great read. I was absolutely captivated, and couldn't put the book down when I was able to read. I'm looking forward to reading Desires of the Dead now! Did you love this book??? Leave me a comment and let me know what you thought of it! This sounds really interesting. I am going to add it to my wishlist. I seriously LOVED this book! I have yet to read Desires of the Dead, but it is at the top of my list! Great review! I loved this one! Desires of the Dead was a great followup to the series! Kimberly also says she's been contracted for 2 more books in the series!! I've not read it yet but I do own it. Can't wait to get to it. Great review! I just finished reading and reviewing this novel on my blog. I absolutely adored it and thought Jay and Violet's relationship was amazing. You are so right about how creepy the two killers were. Thanks for the review! Thanks guys!! I can't wait to read Desires of the Dead. I'm glad everyone else enjoyed The Body Finder as well. Great book! I'm reading it right now and I LOVE it! I love Jay and Violets friendship/relationship. It is so great to see a romance that has developed over time, and isn't just "Hot guy possessing powers or something shows up, average girl and hot guy fall in love, whirlwind romance, some kind of danger, guy saves girl...the end" lol It worked for Twilight, but not the ten million other books that came after..